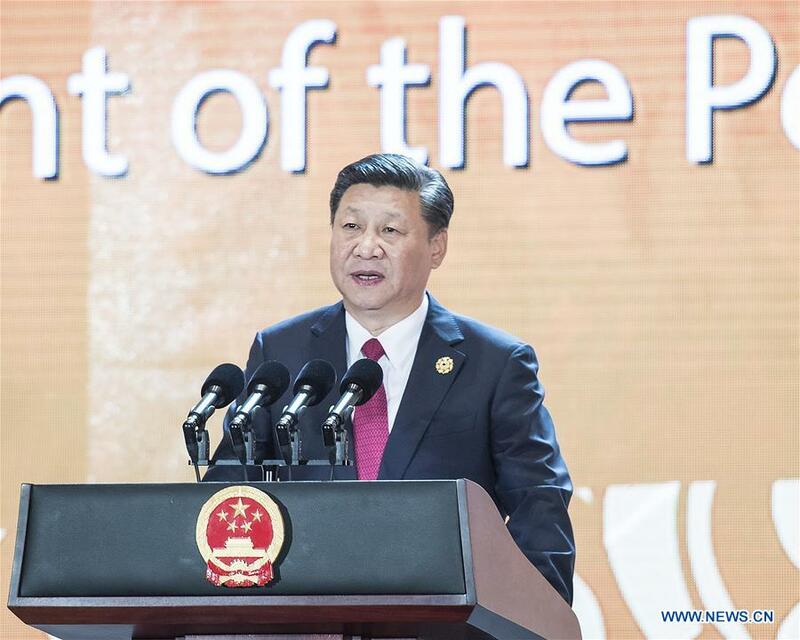 DA NANG, Vietnam, Nov. 11 (Xinhua) -- Chinese President Xi Jinping on Friday made a keynote address titled "Seizing the Opportunity of a Global Economy in Transition and Accelerating Development of the Asia-Pacific" at the Asia-Pacific Economic Cooperation (APEC) CEO Summit here. Good afternoon! I am glad to come to Da Nang and meet all of you again. Our region, the Asia-Pacific, has the biggest share of the global economy; and it is a major engine driving global growth. The business community is a primary contributor to growth, as it keeps exploring new ways of development. That's why during the APEC Economic Leaders' Meeting over the last several years, I have always taken time to meet business leaders and discuss with you approaches and measures to address the challenges we face. It has been 10 years since the international financial crisis broke out. Over the last decade, the international community have worked in concert to steer the global economy back to the track of recovery. Thanks to our efforts, the global economy is improving. Despite risks and uncertainties, global trade and investment are picking up, people are more optimistic about the outlook of financial markets, and confidence is growing in all sectors. Development is a journey with no end, but with one new departure point after another. An ancient Chinese philosopher once observed, "We should focus our mind on the future, not the past." We live in a fast changing world, and the global economy is undergoing more profound changes. We must therefore closely follow the trend of the global economy, identify its underlying dynamics, keep to the right direction, and, on that basis, take bold action. -- We are seeing a profound change in growth drivers. Countries are turning to reform and innovation to meet challenges and achieve growth. The potential of structural reforms is being unlocked and its positive impact of boosting growth of various countries has become more evident. A new round of technological and industrial revolutions is gaining momentum. Digital economy and sharing economy have registered rapid growth. New industries as well as new forms and models of business are flourishing. As a result, new growth drivers are being created. -- We are seeing a profound change in the model of global growth. As time advances, development has taken on profoundly richer implications. The vision of innovative, coordinated, green and open development for all is gaining increasing public support. To achieve more comprehensive, higher quality and more sustainable development has become the shared goal of the international community. To implement the 2030 Agenda for Sustainable Development and adapt to climate change and other challenges of a global nature has become an important international consensus. -- We are seeing a profound change in economic globalization. Over the last few decades, economic globalization has contributed greatly to global growth. Indeed, it has become an irreversible historical trend. Against the backdrop of evolving global developments, economic globalization faces new adjustments in both form and substance. In pursuing economic globalization, we should make it more open and inclusive, more balanced, more equitable and beneficial to all. -- We are seeing a profound change in the system of global economic governance. The evolving global economic environment demands more from the system of global economic governance. We should uphold multilateralism, pursue shared growth through consultation and collaboration, forge closer partnerships, and build a community with a shared future for mankind. This, I believe, is what we should do in conducting global economic governance in a new era. Faced with the profound changes in the global economy, should we, the Asia-Pacific economies, lead reform and innovation, or just hesitate and proceed haltingly? Should we steer economic globalization, or dither and stall in the face of challenge? Should we jointly advance regional cooperation, or go our separate ways? This is my answer: We must advance with the trend of times, live up to our responsibility and work together to deliver a bright future of development and prosperity for the Asia-Pacific. First, we should continue to foster an open economy that benefits all. Openness brings progress, while self-seclusion leaves one behind. We the Asia-Pacific economies know this too well from our own development experience. We should put in place a regional cooperation framework that ensures consultation among equals, wide participation and shared benefits, build an open Asia-Pacific economy and promote trade and investment liberalization and facilitation. We should make economic globalization more open, inclusive and balanced so that it benefits different countries and people of different social groups. We should proactively adapt to the evolving international division of labor and actively reshape the global value chain so as to upgrade our economies and build up new strengths. We should support the multilateral trading regime and practice open regionalism to make developing members benefit more from international trade and investment. The building of a free trade area of the Asia-Pacific (FTAAP) is the long-cherished dream of the business community in our region. It was in response to the call of the business community that APEC leaders, for the first time, initiated the FTAAP vision in Hanoi in 2006. In 2014, the FTAAP process was launched in Beijing. We should get into action, fully implement the Beijing Roadmap, move toward the FTAAP and provide an institutional underpinning for growing an open economy in the Asia-Pacific. Second, we should continue to pursue innovation-driven development and create new drivers of growth. The current global economic recovery is, to a large extent, the result of cyclical factors, while the lack of self-generating driving forces remains a nagging problem. To avoid the risk of the global economy entering a "new mediocre", we must sustain growth through innovation. The new round of technological and industrial revolutions is unfolding before us. Digital economy and sharing economy are surging worldwide, and breakthroughs have been made in new technologies such as artificial intelligence and quantum science. We in the Asia-Pacific cannot afford to be just onlookers. What we should do is to seize the opportunity, increase input in innovation, change the model of development and nurture new growth areas. We should promote structural reform, remove all institutional and systemic barriers to innovation and energize the market. We should implement the APEC Accord on Innovative Development, Economic Reform and Growth adopted in Beijing, deepen cooperation on the internet and digital economy and strive to be a global leader of innovative growth. Third, we should continue to enhance connectivity and achieve interconnected development. Interconnected development is the best way to achieve mutual benefit and win-win outcome. We the Asia-Pacific economies are closely connected, and our interests are interlocked. Such an interconnected development will both open up new horizon for our own development, and create driving force for us all to achieve common development as partners. In 2014, the APEC Connectivity Blueprint was formulated. This Blueprint should guide our efforts to build a comprehensive, all-round and multi-tiered Asia-Pacific connectivity network. We should boost the real economy through the building of connectivity, break bottlenecks to development and unlock potentials. With these efforts, we can achieve coordinated and interconnected development. In May this year, the Belt and Road Forum for International Cooperation was successfully held in Beijing. The Belt and Road Initiative calls for joint contribution and it has a clear focus, which is to promote infrastructure construction and connectivity, strengthen coordination on economic policies, enhance complementarity of development strategies and boost interconnected development to achieve common prosperity. This initiative is from China, but it belongs to the world. It is rooted in history, but it is oriented toward the future. It focuses on the Asian, European and African continents, but it is open to all partners. I am confident that the launch of the Belt and Road Initiative will create a broader and more dynamic platform for Asia-Pacific cooperation. Fourth, we should continue to make economic development more inclusive and deliver its benefits to our people. The current headwinds confronting economic globalization is mostly generated by the lack of inclusiveness in development. Hard work is still needed if we are to bring the benefits of development to countries across the globe and people across our society, and thus turn our vision into reality. Over the past few years, we have actively explored ways to promote inclusive development and have built strong consensus about it. We should deepen regional economic integration, develop an open and inclusive market and strengthen the bond of shared interests. We should make inclusiveness and sharing a part of our development strategies, improve systems and institutions to uphold efficiency and fairness, and safeguard social equity and justice. We should invest more in education, medical care, employment and other areas that are important to people's livelihood, and address poverty and the widening gap between the rich and the poor. We should reach out to disadvantaged groups, improve business environment for micro, small and medium-sized enterprises, and enable the workforce to better adapt to industrial transformation, so that everyone will have his fair share of opportunity and benefits. As an old Chinese saying goes, a commitment, once made, should be delivered. Boosting development in the Asia-Pacific requires real actions by all of us members. As the world's second largest economy, China knows fully well its responsibility. Over the past five years, we have taken proactive steps to adapt to, manage and steer the new normal of China's economy and deepened supply-side structural reform. As a result, China's economy has maintained steady performance, and we are pursuing better-quality, more efficient, fairer and more sustainable development. Over the past four years, China's economy has grown by 7.2% on the average annually, contributing over 30% of global growth. China is now a main driver powering global growth. We have worked hard to remove systematical institutional barriers that impede development through comprehensive reform. As many as 360 major reform initiatives and more than 1,500 reform measures have been taken. Breakthroughs have been made in key areas, and general frameworks for reform have been put in place in major sectors. We have sped up efforts to build new institutions of the open economy and transform models of foreign trade and outbound investment to continue the shift from quantitative to qualitative improvement in trade. We have advanced theoretical, practical, institutional, cultural and other explorations to unleash new impetus for growth. China has become a huge platform where all factors and players of innovation converge to make a real difference. From infrastructure to various economic sectors, from business models to ways of consumption, innovation is leading the way. We have pursued a people-centered philosophy of development to make our development more inclusive and beneficial to all. Individual income has registered sustained growth, outpacing GDP growth for many years. Income gaps between urban and rural areas and between different regions have been narrowing, middle-income group expanding, and Gini coefficient dropping. More than 13 million new urban jobs have been created every year for four consecutive years. Significant advances have been made in pursuing green development, resulting in considerable reduction in the intensity of energy and resource consumption and marked improvement in the ecological environment. To lift all the remaining poor people out of poverty is a solemn commitment made by the Chinese government to the people. It is uppermost in my mind, and I have spent more energy on poverty alleviation than anything else. Over the past five years, I have been to many poor areas in China to pin down the causes of poverty and address them in a targeted way. As a result, decisive progress has been made in the fight against poverty. Over the past five years, we have lifted more than 60 million people out of poverty. The poverty headcount ratio has declined, and per capita rural income in poor areas has maintained double-digit growth. This has not come easily, and we are proud of what we have achieved in poverty alleviation. China's development is an evolving historical process. Last month, the 19th National Congress of the Communist Party of China was successfully convened in Beijing. Responding to our people's desire for a better life, the Congress formulated a guide to action and a development blueprint for China in the new era. It is envisaged that by 2020, China will turn itself into a moderately prosperous society in all respects, and by 2035, China will basically realize socialist modernization. By the middle of this century, China will become a great modern socialist country that is prosperous, strong, democratic, culturally-advanced, harmonious and beautiful. Under the leadership of the Communist Party of China, the Chinese people will embark on a new journey. First, this is a new journey of deepening reform across the board and unleashing dynamism for development. To resolve difficulties and problems on the way forward, we must deepen all-round reform. We will focus more on solving problems, get rid of all outdated thinking and ideas and all institutional ailments and break through the blockades of vested interests to inspire creativity and vitality throughout society. We will develop a set of institutions that are well conceived, fully built, procedure based, and efficiently functioning and achieve modernization of China's system and capacity for governance. Next year, we will celebrate the 40th anniversary of China's launching of the reform and opening-up initiative. China's reform will cover more areas; and more and stronger steps will be taken in pursuing this endeavor. Second, this is a new journey of moving with the times and exploring new model of development. China's economy is in a transition from a phase of rapid growth to a stage of high-quality development. We will be guided by a new development philosophy, put quality first, give priority to performance and develop a modernized economy. We will pursue supply-side structural reform as our main task, work hard to achieve better quality and higher efficiency performance, and create more robust growth through reform. We will raise total factor productivity and accelerate the building of an industrial system that promotes coordinated development of the real economy with technological innovation, modern finance, and a talent pool. We will endeavor to develop an economy with more effective market mechanisms, dynamic micro-entities, and sound macro-regulation. All these efforts will make China's economy more innovative and competitive. We will promote further integration of the internet, big data, and artificial intelligence with the real economy, and cultivate new drivers of growth in digital economy, sharing economy, clean energy and other areas. We will continue to explore new mechanisms and pathways for achieving coordinated development among regions, promote coordinated development of the Beijing-Tianjin-Hebei region, Yangtze Economic Belt, Xiongan New Area, and Guangdong-Hong Kong-Macao Greater Bay Area, build world-class city clusters and foster new source of growth. As China works hard to pursue innovation and higher quality of growth, new forms of business will keep emerging, more innovations will be used, and development of various regions in China will become more balanced. All this will create a more powerful and extensive impact, present more opportunities of cooperation and enable more countries to board the express train of China's development. Third, this is a new journey toward greater integration with the world and an open economy of higher standards. China will not slow its steps in opening up itself. We will work together with other countries to create new drivers of common development through the launching of the Belt and Road Initiative. We will adopt policies to promote high-standard liberalization and facilitation of trade and investment. We will implement the system of pre-establishment national treatment plus a negative list across the board, significantly ease market access, further open the service sector, and protect the legitimate rights and interests of foreign investors. All businesses registered in China will be treated as equals. We will grant more powers to pilot free trade zones to conduct reform, and explore the opening of free trade ports. We will speed up negotiations with partner countries on the concluding of free trade agreements and investment treaties, advance the building of FTAAP, work for the speedy conclusion of RCEP negotiations, and endeavor to establish a global network of free trade areas. In the next 15 years, China will have an even larger market and more comprehensive development. It is estimated that China will import US$24 trillion worth of goods, attract US$2 trillion inbound direct investment and make US$2 trillion of outbound investment. In November next year, China will hold the first China International Import Expo in Shanghai, which will provide a new platform for expanding cooperation in China's market among all parties. Fourth, this is a new journey toward a better life for the people. To secure a better life for our people is what we aim to achieve in everything we do. We will ensure and improve living standards through development and meet people's ever-growing needs for a better life. We will continue to promote social fairness and justice to see that our people will always have a strong sense of gains, happiness, and security. We will continue to implement targeted poverty reduction and alleviation measures and ensure that by the year 2020, all rural residents living below the current poverty line are lifted out of poverty. Each and every one of the over 1.3 billion Chinese people should lead decent lives. No one will be left behind! We will speed up institutional reform for ecological conservation, pursue green, low-carbon and sustainable development, and implement the strictest possible system for environmental protection. By 2035, there will be a fundamental improvement in the environment; the goal of building a Beautiful China will be basically attained. We will actively tackle climate change, and protect our common home for the sake of human survival. China's carbon dioxide emission is expected to peak around 2030, and we will make every effort for such emissions to reach the peak ahead of time. We will increase the share of non-fossil fuels in primary energy consumption to around 20% by 2030. Once we set a target, we will not stop our efforts until it is met! Fifth, this is a new journey toward a new type of international relations and a community with a shared future for mankind. The dream of us Chinese is closely connected with the dreams of people of other countries. Our world is full of challenges and the road ahead will not be smooth. But we will not give up on our dream. We will double our efforts and work with all others to build an open, inclusive, clean, and beautiful world that enjoys durable peace, universal security, and common prosperity. We Chinese believe that peace is most precious and that there should be harmony among all nations. We are committed to peaceful development and we will remain an anchor for peace and stability in the Asia-Pacific region and beyond. China will, guided by the principle of upholding justice while pursuing shared interests, actively develop global partnerships, expand the convergence of interests with other countries, and work to foster a new type of international relations featuring mutual respect, fairness, justice, and win-win cooperation. Acting on the principle of achieving shared growth through consultation and collaboration, we will get actively involved in reforming and developing the global governance system to make the international political and economic order more just and equitable. All of our people in the Asia-Pacific deserve peace, stability and prosperity; and all of us in the region should jointly deliver a bright future for the Asia-Pacific. Partnerships based on mutual trust, inclusiveness, cooperation and mutual benefit: This is what keeps our big Asia-Pacific family together and ensures the success of Asia-Pacific cooperation. Let us take solid steps to promote cooperation and usher in an even brighter future for the Asia-Pacific.